Spending a week in this centrally located hotel minutes from Independence Square was a treat for this business traveller. A short walk from shopping and St Michaels magnificent cathedral there was always lots to see and do. With two restaurants in the hotel I was able to choose from Japanese or tasty Ukrainian food. Right next door was the Buddha Bar a very interesting and exotic Thai restaurant. Further down was a Karaoke bar and steakhouse. Or fast food easily at hand. 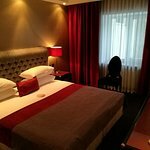 The hotel staff were very friendly and while the room was small it was very clean and modern. Convenient automated and programmable lighting at bedside and bathroom was a treat. 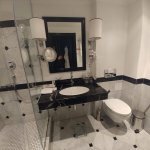 The maid service was excellent, prompt and spotless. A spa is available but I spent more time sightseeing as everything was a short walk or cheap taxi ride away from this location. The front desk was courteous and ensured my early morning taxi (3:00am) to the airport was on time like my wake up calls. A large buffet breakfast was included. Free efficient Wifi and cable TV although there were only four English channels. Even though the hotel is on a busy street traffic noise was barely audible. We stayed here for two nights and were very impressed. The room was good-sized, the closet space exceptional and the view was awesome. From your balcony you can see Maidan and Independence Square. You are literally in the middle of everything. Restaurants, shops, etc. all within a short walk. The breakfast is astounding. High quality. Unfortunately, I had an early flight out of Kiev and had to miss breakfast on my last day there. I HIGHLY recommend this restaurant. It is worth the money. Dear Guest!We are thankful to Youfor choosing Khreschatyk hotel as a place for your accommodation. It is a great pleasure for us to read that You liked the hotel and were pleased with our services. You comments are very important for us it is an additional stimulus for our staff to work even better. We will be glad to welcome You here again. Kind regards, Khreschatyk hotel's administration. The hotel is in an excellent location and is very clean. The room was good and most of the staff were nice. The breakfast is not good though and ridiculously priced, you'd be better off going down the road and get a great breakfast for a fraction of the price. The price of one breakfast here will pay for a whole weeks breakfast elsewhere and is just not worth it. In addition when I spoke to the receptionist he did not care that we were unhappy about it. We stayed several nights on business at this hotel. The reception area is large with plenty of areas to meet and discuss. 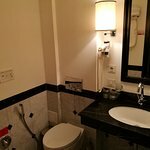 Rooms are large, well appointed, and have very nice bathrooms. You must iron your clothes in the hallway, they won't let you borrow an iron to bring into your room. There is a Buddha Bar directly next to the hotel which is good for evening business events. The breakfast could have been better, for the size of the hotel and the apparent quality level the breakfast is slightly disappointing. Very nice hotel in a great location (especially if you're using solo east for the Chernobyl trip). Plenty of bars/restaurants/ shops/historic attractions within walking distance. 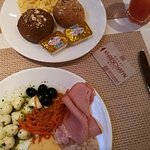 Decent breakfast selection that is better than other Eastern European hotels I've stayed in. If you're looking at visiting the Buddha bar, which is linked to the hotel website, its not in the hotel it's a couple of doors away. I stayed here for two nights on a weekend. 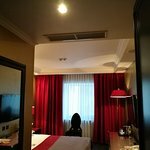 This hotel is in the very center of Kiev and also close to plenty bars and restaurants. The rooms are nice yet not extremely modern. The breakfast was alright, but nothing special.